My Kitchenis full of lingering smells and tastes of Sambars and Rasams,Panasa Pottu ava pettina kura,Thotakura ava pulusu,Majjiga pulusu..etc etc.there are a few varieties of Rasams.Mysore rasam,Miriyala charu,Ordinary rasam,Mulaga charu(Drum stick),only with Coriander leaves i prepare Kothhimeeri charu,it tastes good,. For Rasam powder:one cup Turdal,half of the cup Dhania(coriander seeds)(half of turdal),one fourth cup Jeera ,and one fourth cup Pepper (half qty of dhania)Asaefoetida a small piece,.roast all these ingredients and make it a Powder. This Rasam is good for Digestion,and a small secret for good tasty rasam is,i use Tamarind,of last year.here in Andhra we preserve tamarind for the whole year by drying it in sun in the month of may,for 2 to 3 afternoons.then we keep it in a airtight container.for a tasty rasam i use this tamarind,if it is not available then use only ordinary tamarind. Keep a vessel on stove,add 2 spoons Oil, add Mustard seeds half a sp, RedChilly (slits of 2 nos),a pinch Asaefoetida,a pinch Fenugreek seeds.after it splutters add Water ,Tamarind( a size of lemon),Salt half sp,2 to 3 spoons Rasam powder,Curry leaves,Corriander leaves,let it boil on slow to medium flame for 20 mins.switch it off. 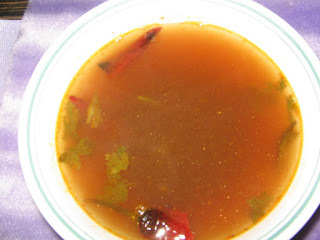 This rasam i often prepare in my kitchen..